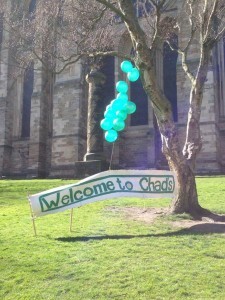 St Chad’s was founded in 1904, the second hall to be accorded College status in Durham. A Church of England foundation (like almost all old colleges), it follows the rhythms and patterns of traditional English college life, without being too bound by tradition. As a College, the staff and students have a particular commitment to addressing key social and ethical issues in their research, and the range of College Fellows (currently numbering twenty or so) reflects these concerns. 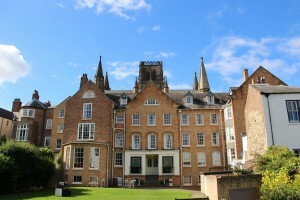 With around 500 students, St Chad’s remains Durham’s smallest college; though over the years it has had proportionately more postgraduates than any other college. Currently, over 20% of the students at St Chad’s are reading for research and taught Master’s and PhD levels. The College also has a number of postgraduate education (PGCE) students every year. St Chad’s has recently expanded its postgraduate provision, and is looking to further improve the postgraduate facilities. In 2001, the College founded Trinity Hall, refurbishing a spacious 35 room Victorian building, and equipping it with 22 en-suite rooms (and 3 with shared facilities). By most accounts, it remains the best self-catering postgraduate accommodation in Durham, located just across the river from Durham Cathedral. The main part of the College sits across the street from the Cathedral. Main College building, and the other various College residences, together house around 180 undergraduates plus around a dozen postgraduates in catered accommodation (catered in term-time: outside of term there are numerous kitchenettes to allow for self-catering). Unlike most other Durham colleges, St Chad’s has its own college-based academic and research staff. This gives the College a unique character, which ought especially to appeal to postgraduates. Our College Fellows have wide ranging academic interests and postgraduates from all disciplines are welcome to apply. Fellows, staff and students of all ages and degree level dine together and mix freely; and because of our modest size, postgraduates have ample opportunity to get to better know the college community. Meals are taken in cafeteria style, and twice a week the College dons gowns and dines formally, allowing for a sit-down and more leisurely three-course meal with wine. The Common Rooms often gather before or after such meals for various events, talks and socialising. To encourage residents to take advantage of such occasions, these meals are included in the room and board charge (battels) for those living in College. The Postgraduate Director has responsibility for convening academic events that draw postgraduates and others together. Postgraduate Seminars or Forums take place throughout the year, and they give students an opportunity to discuss their own research and to hear active researchers describe their work. The Senior Common Room has lectures and ‘conversations’ given by senior members of the College, or their guests, to which postgraduates are always invited. Within academic communities, it is common to distinguish undergraduates, postgraduates and academic staff by ‘common rooms’. Undergraduates belong to the Junior Common Room, or JCR; postgraduates belong to the Middle Common Room (MCR) and academic staff belong to the Senior Common Room (SCR). The term ‘common room’ thus denotes both a shared room but also, and more importantly, a shared community. The MCR co-ordinates social events for postgrads, and is represented by an Executive Committee, headed by the MCR President who sits on the College’s Governing Body, and is an actual trustee of the College with a full vote. MCR members are represented on virtually all of the College’s other committees, including the the Finance Committee, the Academic Board and the College (Maintenance) Committee. A considerable number of postgraduates live out of College, but whether they live in or out, they are invited to be fully integrated into the life of the College through academic and social events organised through the Middle Common Room. The College and University departments are able to offer guidance on how to apply for postgraduate financial support. Student Finance England provide PG Masters loans and PG Doctoral loans. Generally-speaking, UK postgraduates who are not in receipt of Research Board funding are expected to be self-funding, and they are required to have a sound financial plan in place before they can register. The College has a small number of postgraduate scholarships available, and the College can provide application forms for the University Hardship Fund, which is available to UK postgraduates whose circumstances change while they are studying (i.e. they can no longer do afford the programme because of unforeseen circumstances). The choice of a college is especially important for postgraduates. One would want a stimulating intellectual environment in which to devote maximum attention to research. This is guaranteed at St Chad’s, and at the same time the collegiate living provides many other advantages, such as an environment in which to relax. Many postgraduates find the prospect of solitary studying a bit daunting, and having student neighbours not far away can be a welcome tonic. In addition, there is the possibility of a partnership with fellow common room members. 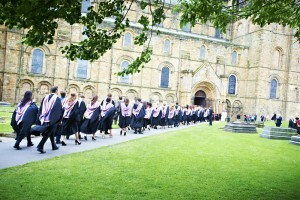 In terms of selecting from among Durham’s colleges, each has its own strengths, and postgraduates should consider all their options. St Chad’s strength is arguably the easy interaction between students and academic staff, the excellent relations with a very active Junior Common Room (so that you can take advantage of everything offered to undergraduates, especially social events), and a real involvement in all aspects of College life. The College has eight on-site library rooms, each one covering a discrete range of topics, and they are stocked to provide the texts required by the most highly subscribed modules. There is also an important research library, the latter being a home-away-from-home for a number of postgrads. Each of the libraries has study tables, and most operate on an honour system. The College has a Chapel, where weekly services are held during term. The Quad, a large glass-covered courtyard (pictured left), is the central meeting place in College. Close to the Quad are several TV rooms, two bars, a launderette, and a gym. Outside, there are several acres of gardens, leading down to the River Wear and the College boathouse. Each residence has at least one kitchenette, while Trinity Hall has its own kitchen with enough space for a half-dozen or so people to cook meals at once. Trinity has its own laundry facilities, private gardens and enough car-parking space for all postgraduates. All rooms in College have high speed fibre-optic or microwave access to the internet. The use of computers for research is, of course, always increasing. Many lecturers and departments use email to keep in touch with students, and so postgraduates are thus strongly encouraged to bring or obtain their own computers. The procedures for postgraduate admissions involve a centralised online process to apply for both college membership and accommodation (if required). You will be directed to the appropriate online form when you accept your offer from the University. You may also want to take a look at the University website. Full details of postgraduate courses are given in the University prospectus, and for more detail about the College, consult our on-line prospectus or check out the MCR web pages. If you have further queries or would like more specific information about postgraduate possibilities at St Chad’s, please feel free to email the College. At St Chad’s College, we welcome applications from men and women of all social, financial and ethnic backgrounds without reference to political or religious beliefs to read for degrees at the University of Durham.